This started out as an entirely different and more complicated craft, lol. 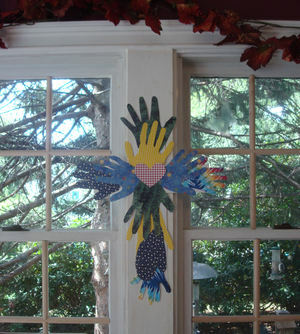 I had thought the boys could make stained glass panels to place in each pane of glass, forming a cross shape as shown above. 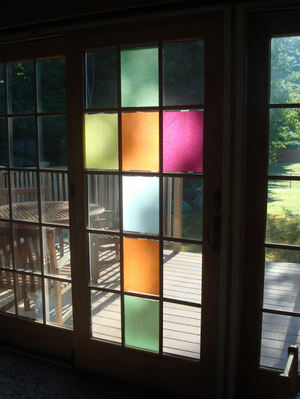 This would be done by sandwiching (many) bits of torn tissue paper between (several) sheets of clear contact paper, cut to fit this multi-paned door. But then, early this morning, as I was guestimating just how long it would take to make enough panels, I discovered that we were completely out of contact paper! What day is it? Crackerjack asked, sensing something was afoot. 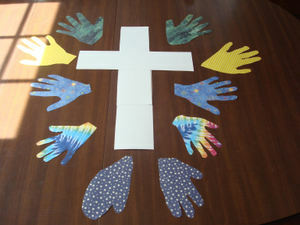 But next, we worked on a new family handprint cross. We made one last year on this day, but I thought it would be nice to update it with fresh paper and current hand sizes. 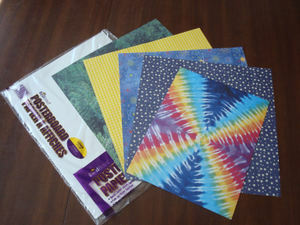 From left to right: white posterboard for the cross base, an evergreen print for Bill, yellow gingham for me, a science theme for Bookworm, navy blue stars for Earlybird and a "cool" tie-dye pattern for Crackerjack (he chose this over fireworks). You might notice EB found it hard to keep his hands still. And here is our family handprint cross for the new year! I like how it looks with all the patterns and, for good measure, I added a red gingham heart to the center. I also like the overall message: all hands to heaven or perhaps, many hands, one heart! Well, I hope you all have a happy weekend! Enjoy the September weather wherever you are, and hold those dear little hands (and hearts) closely! 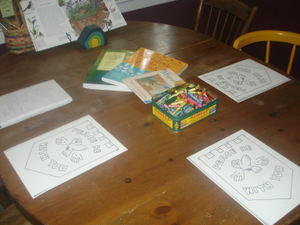 I didn't have a craft planned, or a picture book picked out, but I printed out the weekly coloring page at Catholic Mom.com, and we read aloud Sunday's Gospel (Luke 14: 1, 7-14) from our Magnifikid. The boys colored as I read and we all nibbled on the fruity snack I laid out. Bring 4 cups water to a boil. Add 4 lemon-zinger herbal tea bags and brew for 10 minutes. Discard tea bags. 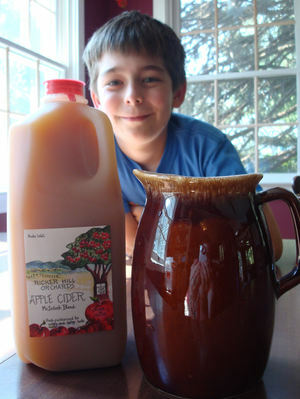 In a large pitcher, combine 1 can (6 oz.) frozen lemonade concentrate, 1 liter plain seltzer and tea. Serve with orange, lemon and lime slices. 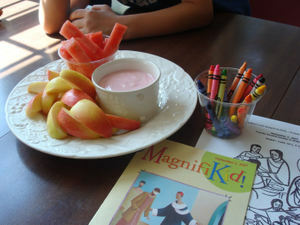 As you can see in the photo above I served watermelon "sticks" and apple slices along with strawberry yogurt for dipping. (It was just too hot to bake!) I explained that these fruits formed a bridge between the seasons - juicy melon from summer and crisp apples for fall. Beginning next week, our table will adopt a distinctly more autumn feel. 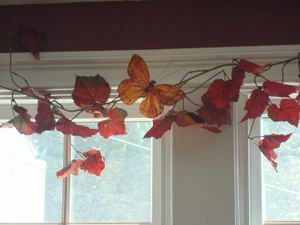 I picked up these garlands at Michaels along with the clip-on silk "fall" butterfly. I only got enough to do one set of windows, so I'll wait for the next store coupon to buy more. ;) I'd like to have Bill weave a strand of tiny white lights in with the garland. 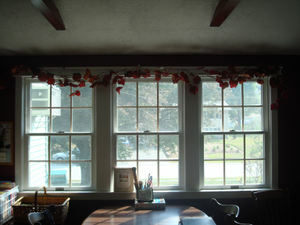 I think fall's dark afternoons will be much enhanced by soft lights twinkling above our workspace. Before it gets too warm (as it's bound to do), I'm going to get some banana breads in the oven. And, later this morning I'll place some calls to local farms to inquire about the availability of green tomatoes. Happy Assumption Day to you! I realized just now that the first Tea-and-Crafts day I ever organized for my children was exactly a year ago today! I even titled the two posts precisely the same. 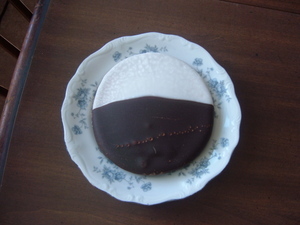 :) Last year's craft was a bit more involved, while the snack was relatively simple. This year, just the reverse was true! I knew we'd be a bit wiped after the long weekend away, so I wanted to make it easy. 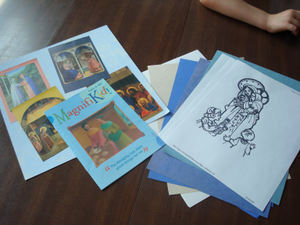 I began with the Magnifkid for today's Mass, and printed out some coloring pages from Women for Faith and Family. In the top picture you can see how I have the prayer corner set up this week. 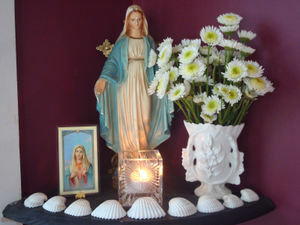 Joining our statue of the Blessed Virgin is a collection of seashells, a prayer candle, a holy card and a vase of summer daisies. I got the idea for this from an episode of the Barefoot Contessa. 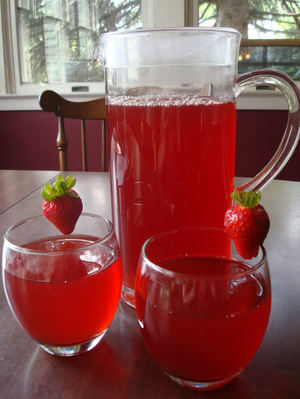 On that particular show, Ina made an iced tea with Lemon Zinger and Red Zinger herbal teas, only she sweetened it with apple juice rather than sugar or honey. 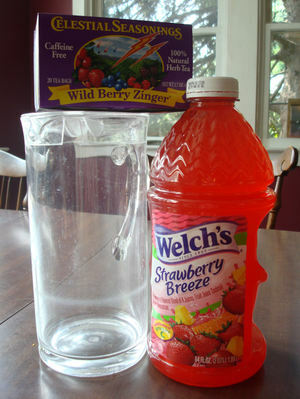 For today's berry theme, I made up a pot of Wild Berry Zinger tea and served it over ice with a generous splash of strawberry juice. Very yummy, festive and fun - especially when seved with a ripe red berry on the side! 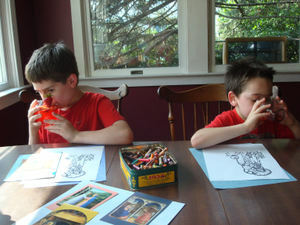 As the boys drank their punch, they worked on their coloring sheets and I read aloud from a favorite Tomie de Paola book, Mary: The Mother of Jesus. Yes, I will be posting more about the new learning room corner very soon! In the meantime, I hope you all had a lovely Assumption Day and I wish you all a very good night. If you notice, my Countdown Widget reads 0-0-0-0! It's time to update that to a Countdown-to-Autumn (my favorite season of all). But before I get ahead of myself, a bit about summer, which technically, begins at 2:06 this afternoon. Secondly, did you see the space-station/shuttle flyover last night? So very, very cool. The viewing was even better last night than the night before. We also spotted a planet or two, some bats and fireflies, as well. Summer nights are the best. So what will you do with all this extra sunlight today? Technically, today is the day the sun gives up it's reign and starts making more room for the night. Yes, from here on out, the days will actually be getting shorter. Maybe that's why summer seems to fly by? The white part also happens to mirror tonight's crescent moon! We'll be reading ahead for Sunday ~ for Mass and the Nativity of St. John. 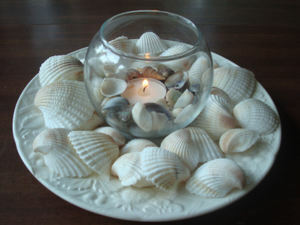 St. John's Day is also celebrated as Midsummer all over the world with bonfires, special foods and stories. I have a nice book of Shakespeare for kids which recounts, in just a few pages, the well known tale of A Midsummer Night's Dream. I think I will read that aloud as we eat - maybe tomorrow, depending on time and attention spans. 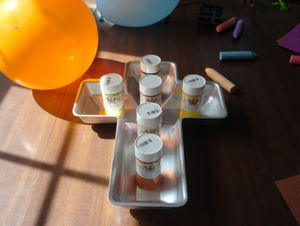 I also have a simple sun craft for the boys to work on, too, one I found in All Year Round. I'll try to post pictures when we're done. Well, however you celebrate this most summery of all days, enjoy! *Update: The shuttle landing has postponed till 3:30 p.m. due to cloud cover. Make that Friday. Thanks, Nancy! Wow, is it Thursday already? This week is flying by! I admit I was a bit unprepared for our lessons this week, including our weekly tea. This past weekend was so busy with the holiday and all, I didn't do my usual planning ahead. Throw in a short week and a doctor's appointment and I was really off! But, enough excuses ~ between today's feast (The Visitation) and Sunday's (Trinity Sunday), there was much to discuss and celebrate! 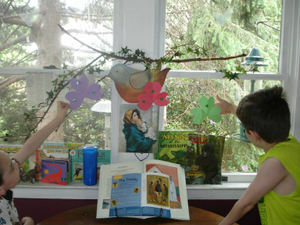 I opened our Marian storybook to the pages about the Visitation, and I also opened Bookworm's Magnifikid for Sunday. 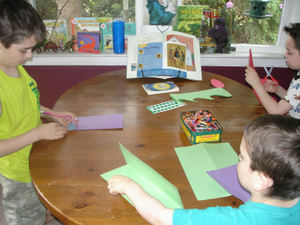 I grabbed some supplies and showed the boys how to make construction paper shamrocks - symbols of the Holy Trinity. Silly me, I had only set out green paper for the shamrocks. Crackerjack wanted red and Bookworm thought purple was a neat choice. 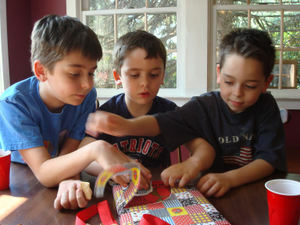 All three boys set about tracing, cutting and taping, as I read aloud. That's a branch I brought in from outside; I livened it up with a silk ivy vine. We talked about the Visitation, and I asked the boys how it feels when we visit their Damee - more importantly, how they thought those visits make her feel? We thought maybe we could plan to do that more often, say once a month after Mass. 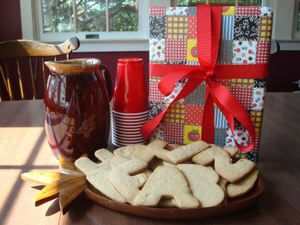 We can plan ahead and make something nice to bring her, too - a craft or some goodies. And speaking of visiting, we have our first house guest arriving this weekend! Bill's sister, fondly known as Aunt Ami around here, will arrive by suppertime tomorrow. The boys are quite excited - so excited they haven't even minded cleaning their room, which will serve as guest room for the weekend. 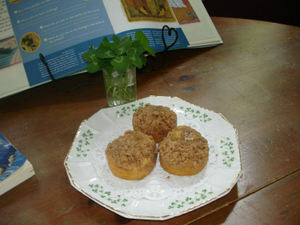 I read in one of my favorite liturgical idea books that coffee cake is a nice treat to enjoy on the Visitation. It so happened we had three small crumb cakes on hand - and placed together on an Irish plate they looked quite like a shamrock themselves. (Not for long, mind you.) Just behind them is the small vase of freshly picked clover from our yard. 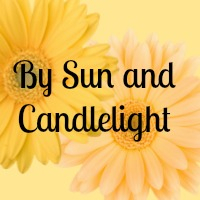 As we finished up our crafts and snacks, I thought about the very kind post that Cindy wrote today at Homeschool Blogger's Community blog, in which she linked to my learning displays. I resolved right then to wipe and polish the table, and put it all back in place for the morning. As you can see we're beginning a dinosaur study just now. I'm trying to be better about keeping this table neat looking when not in use (and right after use) because lately we've had to take our meals around the kitchen island due to an overrun dining area. Plus I really like having it all arranged and (hopefully inspiring) with books and simple decorations that reflect the season or holiday hand. Above the dinosaur encyclopedia (a gift from Uncle Matt this past weekend) is our liturgical masterpiece for May (to be replaced tomorrow with June's selection). Off to the left and right along the windowsill stand the books we are using this week (as well as a few dinosaur toys - CJ's contribution). Also hanging up on the window at left are some newspaper clippings - I don't normally hang them up in this way, but they did get the boys attention. Well, thanks for stopping by, my friends. I hope you had a wonderful Thursday! Well, it was just too hot for tea today! Almost 90 degrees, with barely a breeze or a cloud in the sky. It was almost too hot to bake and craft, too - but we found a little energy late in the afternoon to prepare ourselves for this weekend's great feast ~ Pentecost Sunday! I had seen an idea to make a Pentecost kite in The Big Book of Catholic Customs and Traditions, but I altered the plan a bit to make a windsock with the boys. We've been studying atmosphere and wind in our science studies, so this was timed very well. This is a very simple craft! 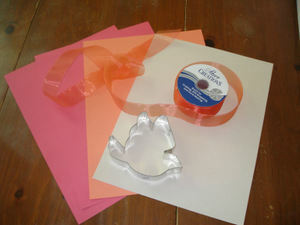 We cut a dove shape out of the white paper and pasted it onto the red. 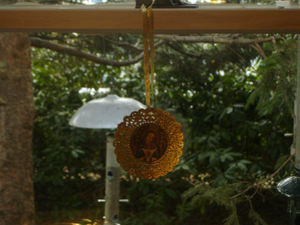 It's hard to see in the pictures but we adorned the dove with golden rays all around. Next we stapled the short ends of the red paper together to form a cylinder shape. 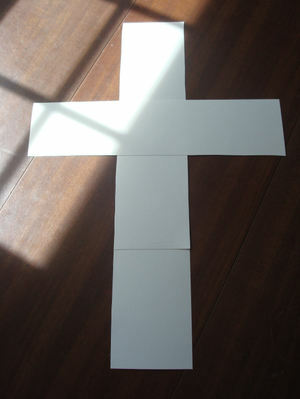 Then we cut seven flame shapes out of the orange paper and on each one we wrote a Gift of the Holy Spirit. 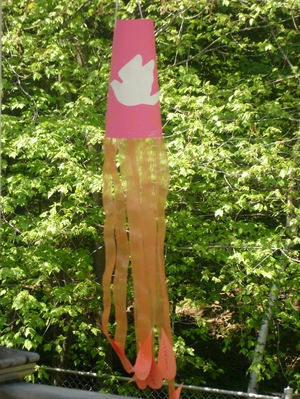 We attached these to the dove topper with orange ribbons, and voila - a Pentecost windsock! We hung it off our deck where we will have our cookout this weekend. While the older boys played, and EB crashed for his nap, I set to work on our teatime snack. 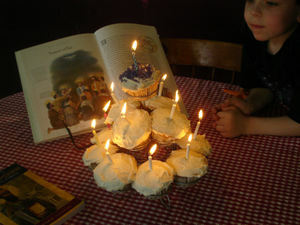 Since this feast is known as the birthday of our Church, I had it in mind to make cupcakes. (When do I not have it in mind to make cupcakes, lol?) And in reminiscense of the Pentecost story, I displayed thirteen cupcakes on our stand, one for each Apostle and one for Our Lady (hers is the blue one at top). 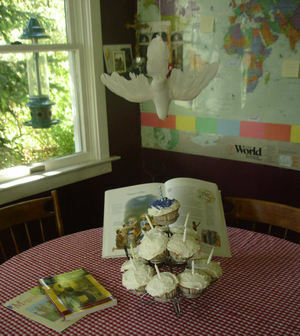 I maneuvered the table a bit so the display would sit directly below our descending dove. "I am sure the whole baby Church was as much in our Lady's care as her own Baby had been and that for the twelve years or so she continued to live in Jerusalem, she spent nearly all her time between praying at home and praying in the Temple, and that only when the Apostles got to Heaven did they realize how much her prayers had had to do with their wonderful success." Well, friends, as always, thanks for stopping by and sharing in our day. I hope you all enjoy a most blessed, safe and beautiful holiday weekend! This afternoon, as the gales blew outside and the rain lashed the windows, we sat down for our Thursday tea. This is the day we read and discuss the coming Sunday's Gospel and, very often we have a little hands-on activity to go with it. And we never forget the refreshments! It's not always tea (though when it is, it's usually Irish decaf. ); sometimes it's cocoa or hot cider ... or as in the case today, warmed vanilla milk. Our snack is usually something baked, a yummy treat for the boys (and me!). Notice the chicken? 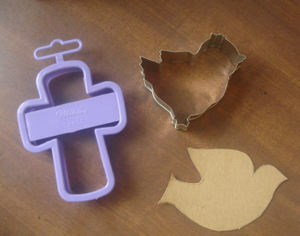 That was going to be pressed into service as a dove, before I made the cardboard template. Crackerjack, looking over my shoulder at the cutters, asked if Jesus ever told any stories about chickens. I told him I didn't think so, but we could check. 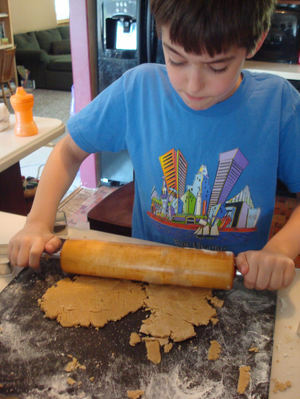 The recipe we used was delicious, and new to us: almond sugar cookies. That's not the actual title of the recipe (it's Sugar Cookie Recipe #2), but because it had almond extract in the ingredients, it appealed to me as something a bit different. We each got a mug filled with "vanilla cocoa," as I sold called it. It was just warmed milk with a little vanilla and a spoonful of vanilla sugar, but it tasted like pure comfort. The boys gave it big thumbs up. Crackerjack, hard at work again ... (he drank two mugs full!). As we read the Gospel story, we brainstormed ways to show the peace of Jesus to others: pray, love, share, go to Mass, teach, show kindness. Along with our banners, they make a nice focal point for Sunday. Peace to you all, and see you in the morning ~ Field Day will be up by mid-day! March 19th is a glorious day on the Catholic calendar ~ the Feast of St. Joseph, a most beloved saint, spouse of Our Blessed Mother, and most importantly, the foster-father of our Lord, Jesus Christ! We've had much fun celebrating Good St. Joseph in little ways throughout the day. To begin with, we made donuts, a traditional feast food, for breakfast. They were oh-so-easy to make - no hot oil, no deep fryer - we just baked them in a special donut pan, which by the way, is currently on sale at The Baker's Catalogue. (Have I mentioned before how much I love this company?). 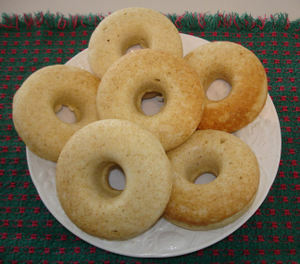 This morning we made plain cake donuts; they were not too sweet, but soft and spongy and rather biscuit-like in taste - with just a bit of nutmeg and cinnamon for kick. While the donuts were still warm from the oven, I made a simple icing from confectioner's sugar and milk. These would be nice with a maple or chocolate glaze, and quite festive at Easter with white chocolate and pastel sprinkles. Next time (probably Sunday after Mass) I will finish them with a light cinnamon-sugar dusting. Yum! We shared some with Nana, too, when she came over to watch Crackerjack and Bookworm while I took Earlybird to speech. Normally I take all the kids with me, but CJ was sick overnight, so Mum popped over to babysit. Just before she arrived, I pulled the pan from the oven and pressed "grind" on the Cuisinart. The coffee was just right with the donuts! 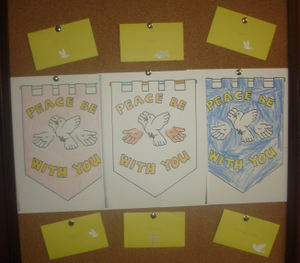 Thanks to some terrific liturgical resources, we had plenty of fun easy crafts to choose from today. 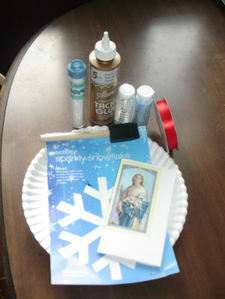 We decided to make St. Joseph's stained glass windows (Seton Art 1 for Young Catholics), do a coloring page (St. Joseph Virtual Altar) along with the words to "Dear St. Joseph" (a song from We Sing and Listen), and turn a shoebox into a rather humble St. Joseph altar (a variation on a theme discussed at 4Real). CJ decorated his coloring page with carpentry stickers, in honor of St. Joseph's trade. Bookworm wrote out the words to "Dear St. Joseph" in his newly acquired cursive penmanship. EB's coloring page is on the lower left. 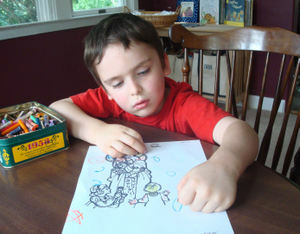 He got overly busy with peeling the crayons, so his picture is only half-finished. The stained glass - to be perfectly honest - was mostly me. Cutting those tiny holes in the black paper (and first the template) proved a bit too fussy for the boys. 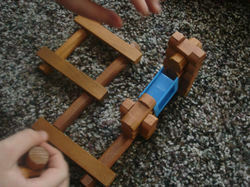 CJ did the picture of St. Joseph in the middle, though. At the bottom you see a few of the books we are reading this week. I am very upset with myself because I waited way too long to order The Song of the Swallows by Leo Politi, and I had so wanted to read it to the boys today. This lovely old book is this week's Catholic Mosaic selection, and a perfect read aloud for St. Joseph's Day (more on the legend here). I did place an order, and it should be here by the end of the week, so we will just have to content ourselves with a new and similarly lovely book about swallows ~ The Easter Swallows (pictured above). I picked this up at our local Catholic gift shop, after a quick read through told me it was a beautiful story for this special time of year - especially for Holy Week. Have you seen this book yet? I believe it is new this year. Pretty illustrations, and a sweet, meaningful story. 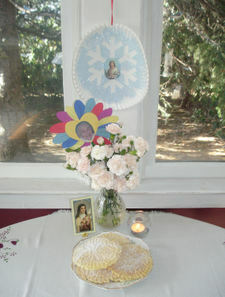 Finally, we made up our St. Joseph's Altar, a very simple take on a beautiful tradition. We started with a shoebox, some stickers and a photocopied prayer from A Year with God. I covered the box in white construction paper and let the boys decorate it. The fruit stickers symbolize the foods that would adorn a traditional altar, the lily stickers represent one of the familiar symbols of St. Joseph. (Do you know the legend of the lilies?) 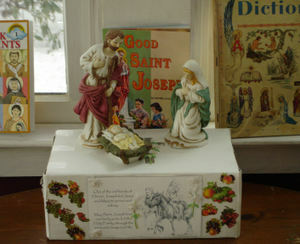 Finally, we pasted the prayer on the front of the box, and I placed our Holy Family set at the top. "Dear St. Joseph, kind and true, I have lessons I must do. They are for your Foster Son. Help me till the work is done. 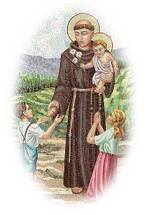 Do not fail to answer me, Dearest Saint, my helper-be." 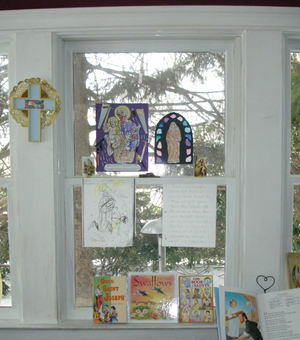 And speaking of lovely, stay tuned for The Loveliness of St. Joseph Altars, hosted by my friend Jenn this Thursday, March 22nd. In the meantime, I wish you a good week and a blessed good night! "That winter was long, but at last spring was there. Then the distant neighbors came to help them build a real cabin. It had four walls, but no windows or door. They had to climb through a hole in the wall to get in and out." Bookworm exclaimed, "Hey, just look at the hole in the wall of our birdhouse!" Why, we mused, this could be the very replica of that cabin from so long ago! I don't think we will ever consider this birdhouse without remembering the good laugh we had envisioning the Lincoln family crawling in and out of that hole! 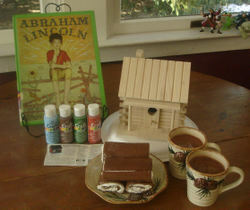 The boys were amazed at the hardships the Lincolns faced, and how at one time they lived in a three-sided house! "What about the wild animals," Crackerjack asked? 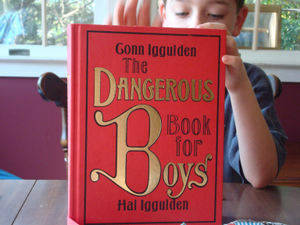 Yes, the dangers were many back then. We felt all the more fortunate for our secure and toasty warm home where the wildest animal we encountered today was the neighbor's cat we chased out of the sandbox! 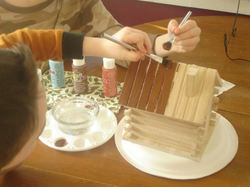 After our snack, we began work on our log cabin bird house. 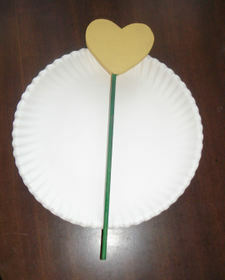 This craft would be fun for any family studying pioneer days. 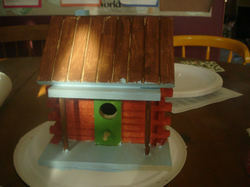 I bought the unfinished wooden bird house at Michael's Arts & Crafts for $4.99. I would assume similar varieties are available in other craft supply stores nationwide. 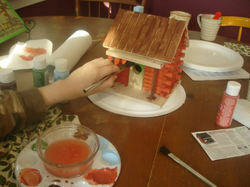 The boys each chose a side and got to work painting the roof. 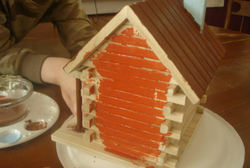 The sides were painted in log cabin red. Bookworm gave the door a coat of green paint. After a bit of blue for the porch, we were done! While I applied a few finishing touches (i.e. 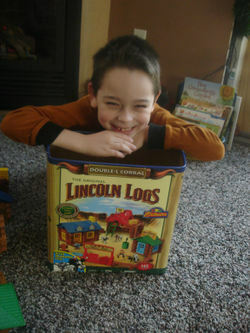 smoothed out a few globs here and there), the boys spent a while building with their Lincoln logs by the fire. ... and Crackerjack just had a good time! So, we will continue reading our book through the week, and Bookworm is also reading this biography. We never did get around to the pretzel log cabin I so wanted to try, but we may save that for Wednesday as a Nor'easter is moving in. A perfect day to work on such a project, while the world turns white all around us. In stark contrast to yesterday, we accomplished very little seat work today. And, at 5:29 p.m., as I type these very words, I am really behind on supper and tidying up. Thursdays are supposed to be for cleaning the learning and living rooms and for starting next week's plans. Usually, we are home all day and these tasks are very easy (or at least not difficult) to incorporate into our day - but today we had afternoon plans that threw a serious (albeit fun) wrench in the works! All in all, though, we had a good day. As usual, I have some photos to share! 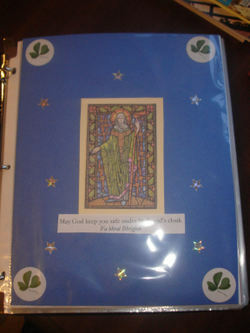 This is an image of St. Brigid I printed out from the internet, taped to a piece of bright blue paper and embellished with star stickers (in remembrance of Brigid's beautiful cloak). 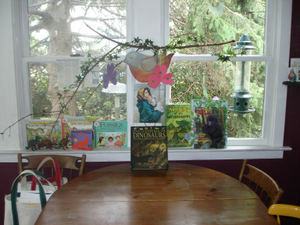 We added shamrocks in each corner and a quote from the book. Then it was all hands on deck, grabbing a quick lunch and readying ourselves for the trip to the library. I had filled the returns bag and printed out pick-up sheets. My mum came over to stay with EB and the older boys and I headed out. By the time we got home it was 2:30 and I was beat (I don't know how those on-the-go mums do it! ), but I really wanted to get to our Thursday tea. Thanks to my liturgical books and the ladies at 4Real, there were so many neat ideas to consider. 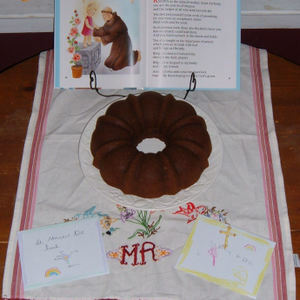 I had found a simple recipe for Brigid's Bread in Catholic Traditions for the Home and Classroom, but once we got home, I was just not up to scratch baking. 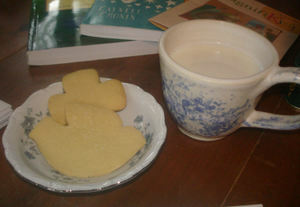 So we set out yesterday's cookies, sliced Irish cheddar and crackers, and we also brewed (decaffeinated) Irish tea. The cheese fit the theme, actually, as Brigid is the patroness of dairy farmers! 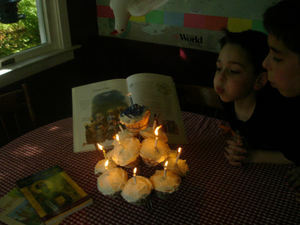 We used my Irish china, and the boys were very careful with the cups. Bookworm, who really loves tea, was pleased to hear about my grandfather (his Pa) who loved Irish tea and drank it daily. I picked up the blue glass candle at the grocery store last weekend - the shade immediately made me think of this book. You can't see it here but there is a beveled cross on the front. 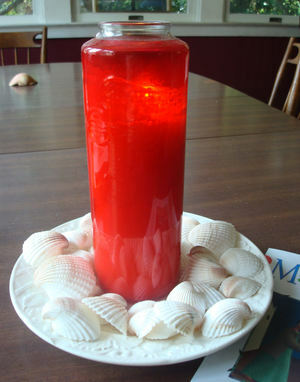 The candle is set on a bright shamrock doiley which I have on hand for St. Patrick's next month! As we ate, we went over the CM vocabulary and discussion questions, and then we began our Mass preparation time. 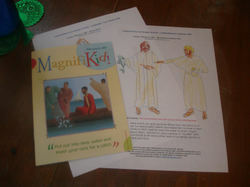 I read Sunday's Gospel from Magnifikid (Luke 5:1-11) while the boys worked on CatholicMom.com's weekly coloring page. 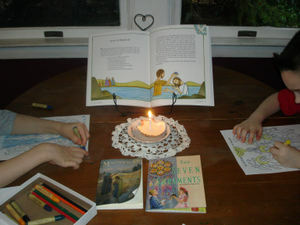 We also read the corresponding story in our Children's Bible. As a follow up activity, I had the boys brainstorm the ways they would have helped Jesus by being "catchers of men." What would they have done as disciples, I asked? 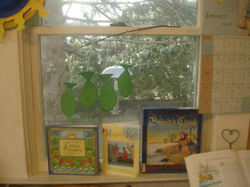 The boys wrote their answers on paper fish shapes which we then hung from a branch tacked up over our window. One of the (many) lovely things about following Cay's Catholic Mosaic Book Study is that we are in such pleasant company! 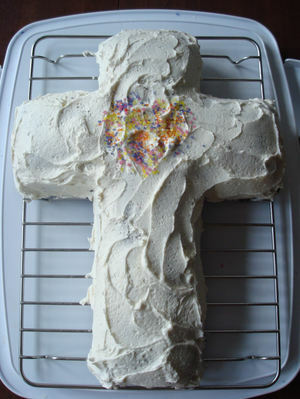 Please stop by Mary Ellen's (who made delicious Brigid Bread) and Mary G's (who made gorgeous Brigid's crosses) today! Today, or rather, tonight, is Burns Night in Scotland, when that nation celebrates the birthday of the beloved poet, Robert Burns. 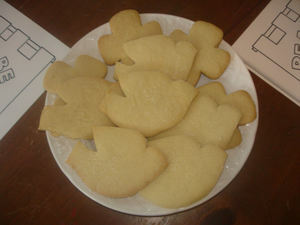 This was a perfect excuse to make delicous shortbread for Thursday tea! Plus, I'm part Scottish so it's my ancestral obligation. And to be perfectly frank, the shortbread was a bit of a miss - I'm the only one who truly enjoyed it, lol! I put too much butter in the ridiculously easy recipe (three ingredients, how could I have gone wrong?) and it never really baked all the way through. It may have been too moist to be authentic, but it was delicious. 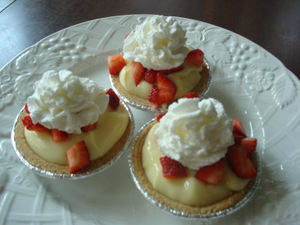 Here's a link to the recipe, which I will try again sometime soon. 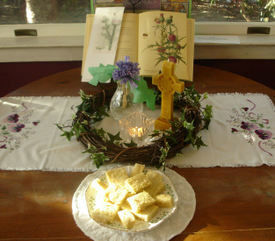 I set the table with our beeswax Celtic cross candle (which I never burn - it's too lovely! ), our Waterford votive (which my folks brought home from Ireland) and my "homegrown" thistle (Scotland's national flower) in a vase. This was a last minute idea - just lavender tissue paper folded and snipped into a thistle shape (more or less) and wrapped with green tissue which I snipped into spear shapes (for leaves). A rubber band held the whole thing together atop a pipe cleaner stem. Very humble, but kind of fun! We read aloud from Magnifikid while we munched on our cookies. 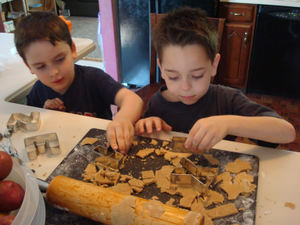 OK, I muched on the cookies - the boys pecked at the cotton candy leftover from yet another failed experiment - edible owl pellets. Yep, you read that right. Edible owl pellets. Well, this warrants some explaining. It was going to be a really neat edible craft project to tie into our owl study (I couldn't wait to tell Meredith) but it was, well, not so neat. Happily, though, it was edible. "When you serve the "pellets" to the children, be sure to tell them to pull the "fur" apart and look for "bones" before eating the whole thing." Anyhoo - it just didn't work out for us. The cotton candy just wouldn't stay wrapped around the pretzel bits, try as we might. It didn't bother the boys much - they were just tickled they were getting cotton candy at all! 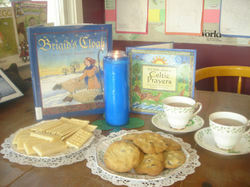 Today, we enjoyed our tea for St. Agnes, and remembered our beloved Grammie, who passed away last year. 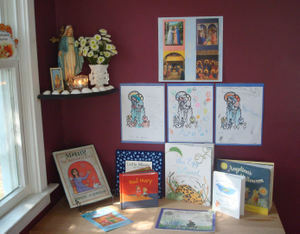 We could not be at her anniversary Mass this weekend, so we planned to remember Grammie in our own way at home. This morning we got to church early so we could light a candle of prayer in her name, and yesterday, we prepared a spiritual bouquet in her honor. You can see it there below, tucked into the real bouquet of "little flowers." (The tiny pale pink carnations, January's flower, smelled so spicy and sweet.) 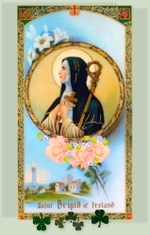 Grammie was greatly devoted to St. Therese, The Little Flower, so today we celebrated three beautiful, saintly women. Over tea we talked about Grammie, and delighted in old memories. She was 101 when she died and lived a long, interesting and joyful life. I'm so glad my boys got to know her and that they remember her still. I am certain they always will. I thought I might share with you how we made the spiritual bouquet - although I am sure many of my readers are familiar with the concept. Each one of us made a promise of prayers - prayers we would gather together in a bouquet of love and remembrance of Grammie. 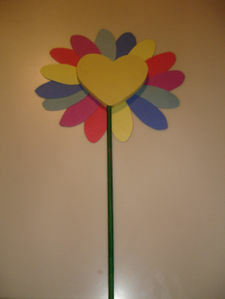 We chose to assemble these prayers in a tangible and memorable way - as a simple flower craft. This is something you could do for anyone in need of prayers or perhaps just cheering up. It would also make a thoughtful Valentine or Mother's Day gift. Each one of us chose an identifying color and cut out little construction paper petals, one each for our promised prayers. Even Earlybird will say those little prayers he is learning - "Amen," "Jesus," and "Mary." The last step was to write our prayers on the petals and glue them all around. 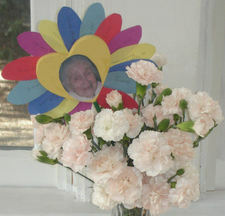 We pasted a picture of Grammie to the center of the flower as well. If your children were making this as a gift for a grandmother or aunt, you could paste a picture of him or her there instead. I hope you all had a nice weekend, and until tomorrow, Good Night and God Bless! Thanks to Kathryn and Gwen at 4Real, I learned these flowers are called St. Agnes's Snowflakes, and that they are closely related to the Snowdrop, one of my favorite garden flowers. (Not that I have any growing in my garden at present - though I hope to very soon.) And thanks to this book, I learned that snowflakes (as in frozen water!) 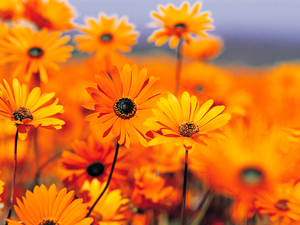 were once called St. Agnes's flowers! Well, this was too lovely a connection to pass up, even though - or maybe especially since - we've had so little snow this year. 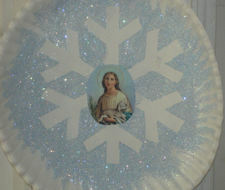 I wanted to plan a craft around snowflakes for this feast, and found just the right one in, of all places, my grocery store flyer! 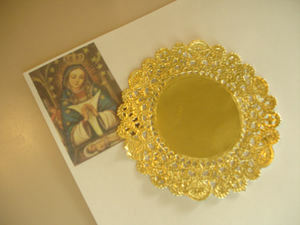 A white paper plate, white glue, glitter, red ribbon, a paint brush and a photocopy of her holy card. (You can find an image of St. Agnes online here.) Also shown is the page I tore from the flyer - who knew there would be crafts tucked in amongst the coupons? 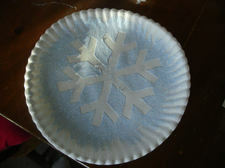 Following the instructions, we cut out the snowflake template and placed it on the center of the paper plate. With a paintbrush (the sponge brush shown above was not firm enough, we found) we spread glue all over the template and plate, brushing the glue out towards the edges from the center. Once the glue was spread all over, we peeled off the template and threw it away (it came off in pieces) and then came the glitter! We chose blue because it is so wintery. After the glue and glitter had dried, we cut the picture of St. Agnes down to a small oval and applied it (with more glue) to the center of the plate. Finally we punched a hole at the top and threaded a red ribbon through it. Tomorrow for tea we will enjoy vanilla pizzelle cookies ~ dusted with confectioner's sugar they will look just like real snowflakes, I think! We will also serve vanilla "tea" - yet another treasure of an idea I am gleaning from Alice. (The tea is actually warmed milk with vanilla and sugar.) I buried a vanilla bean in a tub of sugar over a week ago, so I hope it's ready! I hope you enjoy the rest of your weekend ... and speaking of snow, a storm is predicted for us later this week! 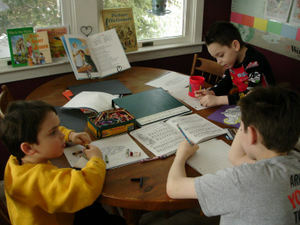 As I mentioned earlier, Thursday is a quiet, homey kind of day for us, so I like to plan any craft or liturgical projects for Thursday afternoons. Sometimes a simple tea seems a perfect complement to our activity, so that gets planned into the day, as well. Now, this is not to say we don't drink tea or do crafts on other days of the week, lol, just that I try to plan for this one at least. I particularly like to revolve our activities around an upcoming feast day, holiday, a loved one's birthday or a special event. But sometimes, it's all about the book we are reading. 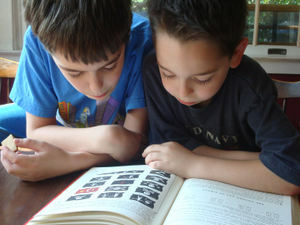 Case in point - any one of the titles suggested in Elizabeth's Real Learning lists or Cay's Catholic Mosaic book study. 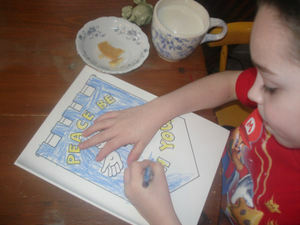 Books such as these are so treasured and meaningful they just cry out to be celebrated with a tea and a craft. 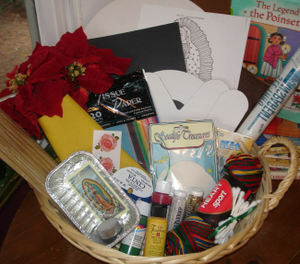 This week's selection was a perfect example - A Gift of Gracias, one of our lovely Catholic Mosaic titles. In this glorious tale, oranges figure prominently. Well, this is so perfect ~ citrus is at its peak in midwinter! I would love to make marmalade sometime, if only I could find an easy recipe. 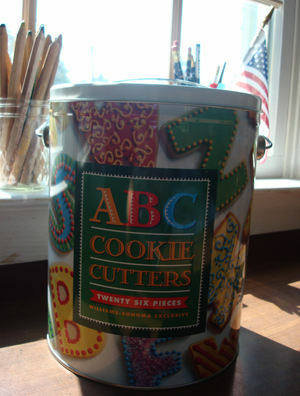 I may just have to order a jar of this instead - oh, my. Marmalade on toast and a cup of strong Irish tea? I can hardly imagine a more delectable winter breakfast. Below you see our small table setting - and as you can see, with three boys, I keep it pretty simple. No lace, no finery - not even a tablecloth! 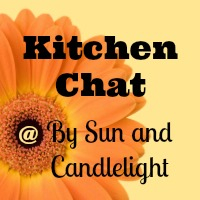 - just some child-friendly dishes, a glowing candle and good things to eat. 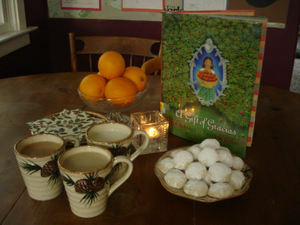 The cookies and tea were a hit, as was the story of little Maria and Our Lady of Altagracia. Each and every title Cay chose for her book study is wonderful, but I think this is my favorite so far. The illustrations are gorgeous - colorful and warm - and the story is so very sweet. 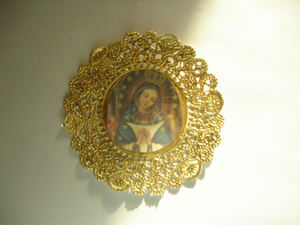 We just cut out the image and glued it to the center of the doily which made a frame both simple and ornate. 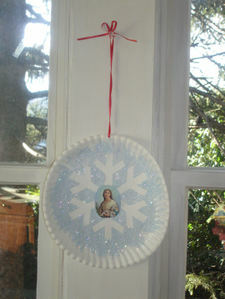 We hung it in our window and there it will hang through Our Lady's feast day this Sunday. 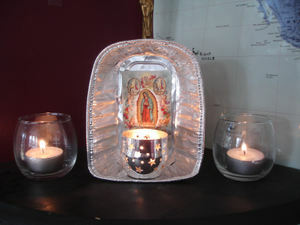 I love to find little ways to weave our Catholic faith, so rich in tradition and rhythm, into our everyday life. There's just so much to explore and embrace, the mind boggles to think of all we could do between January and December. But there is no need to over-extend. Just the daily prayers and devotions, the real learning and time spent together at home, the recognition of the beautiful feasts here and there ... this is all we need. Certainly some days warrant a bit more merriment than usual - a Mass to attend, a party to throw, an elaborate craft to create. But our Church has prepared a whole calendar's worth of days to celebrate our Lord. Blessed are we, to find so many reasons to show and share our praise. I truly believe these little actions - humble, certainly, but nourishing all the same - are weaving a strong, beautiful fabric in our life - a mantle to wrap around my children's hearts. Someday these precious hearts will be bared to the ways of the world. How fervently I pray they will be well prepared to meet those ways - to go forth and show the world their own ways first and foremost, to always be in the world and not of it. So while they are in my charge, I will do my best to prepare them - to help them always know the love of their family, their faith and their God. So let me get on with my post, then. As you already know (or guessed from my title) today is the feast of the Baptism of the Lord. I had nothing big planned as of last evening and then slowly a few things came together. 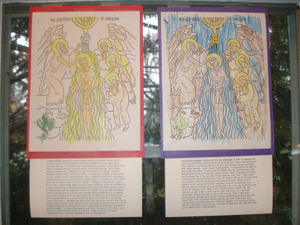 Not the least of which was my generous friend Katherine's lovely coloring page - which I quickly printed out for today. 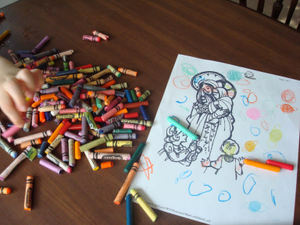 It was so much nicer than the picture I had planned to use from Art 1 for Young Catholics. Over breakfast we read today's Gospel ... and directly afterward we read a chapter from Crackerjack's CCD book. Last week CJ's class read about the sacrament of baptism and they even held a pretend baptism at the holy water font! Everyone was assigned a name tag - cousins, aunts, godparents, priest - our very own Crackerjack got to be the father and hold the baby doll (the "mother" wanted no part of it, lol). When asked what name he gave the child, how my heart swelled when he said with a shy smile, "Dawn." So this experience was fresh in his mind as we began our talk today on baptism. I thought it was neat when I asked the boys "How is water important to us?" and Bookworm responded, "We need it for life. Life begins with water." We immediately connected this to how, with the water of baptism, we begin our life with God. 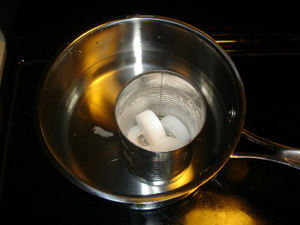 Next thing the boys knew I was at the stove, and had begun making a candle. You can imagine how quickly they joined me! 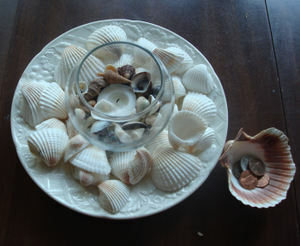 In our faith, one of the symbols of baptism is the seashell, so when I came across a walnut shell candle idea in All Year Round (looking forward to Candlemas) I immediately thought of this variation. It's not really candlemaking - but it comes as close as I ever have! I gathered up a few tea light stubs and placed them in a can, which then sat in simmering water. 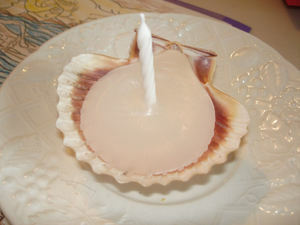 Once the candle wax had melted, I poured it into the waiting (clean, dry) scallop shell. 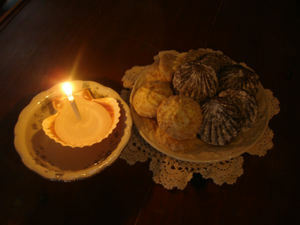 Just a few minutes later, while the wax was still quite soft, I pushed a white birthday candle into the center. There the candle stood, while the wax solidified around it. 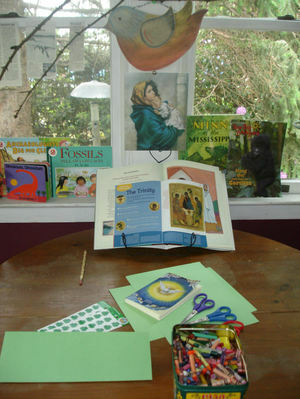 In the background of the picture is the Tomie de Paola Book of Bible Stories, one of our favorite resources, from which I read aloud as they worked. 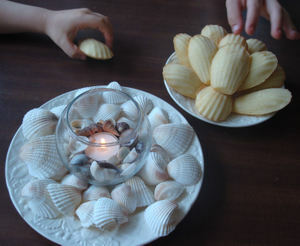 For an afternoon treat we had shell-shaped cookies with tea. These are eggnog clamshells, a local specialty, and Pepperidge Farm Rialto's - chocolate cookie sandwiches filled with raspberry jam and dusted with powdered sugar. (Y-U-M.) After we ate, we worked on maps of the Bible lands (from Uncle Josh's Outine Map Book), locating and drawing in the Jordan River. Earlybird and I stopped at the grocer on the way home from speech and I was inspired to pick up some seafood for supper - scallops, cocktail shrimp, and Annie's Shells-and-Cheese. Easy but memorable. "Something strange happened this day although at first it seemed like nothing could have possibly been so peculiar. As I was walking by the River Jordan, I noticed someone in the river doing strange activities with other people. Upon closer investigation, it appeared to be that he was baptizing them. I had found out about this by overhearing some people talking about it earlier today in town. Well, anyways, now they were asking him if he was the Christ, and he said, “No.” Then when another man came towards the river, he began talking about how he was not worthy to tie the thongs on this man’s sandals. Pretty soon I caught on to the idea that this was the Christ that everyone was talking about and that he was asking the man who was baptizing the others to baptize him. Then in the middle of all this activity the sky opened up and a dove came own to him and then, as I learned afterward, he had the Holy spirit inside of him. After I saw this I immediately headed back to the village and told everyone what had happened. They said they didn’t believe me and I told them that maybe they should go and ask John the Baptist. I’m not sure if they did but I am sure of one thing - the Son of God now has the Holy Spirit within him. I felt amazed." "I was walking along the river Jordan with my brother when all of a sudden I saw tons of people watching someone in the water with another person. I thought they were playing a game in the water and then I realized he was pouring water over that person. The others were all watching. I noticed on the hill there was a group of more people coming and I wondered why. I thought to myself, is this some sort of magic trick or something? Then I realized someone was being baptized but I didn’t know what it really meant. I heard my mom say it before but I never knew what it really meant. I wanted to go ask my mom but it was a long ways back since I’d been walking with my brother for a long, long time. I asked somebody and they said that he was being baptized because he wanted to, but the baptist said at first he didn’t need to be baptized. I knew that he was being baptized for a reason but I didn’t know what reason. And then I saw a dove coming down and I wondered why a dove would be here. It is sort of a rainy day today ... But then I realized the dove was not using the wind it was using golden fire. It flew right into him and I wondered was this some sort of magic trick they’re doing? But then I looked all around and realized it wasn’t magic - it was really going right into his body! I felt like I was trying to make my mind up if it was a magic trick or if it was a celebration and I finally decided it was a celebration." Well, that was our day in a nut, er, seashell! Thanks for bearing with another long post. :) Until tomorrow, Good Night and God Bless! Continuing with our Advent unit study, today we celebrated this beautiful feast with a few simple projects. First we read the Tomie de Paola book, The Lady of Guadalupe. I love this story about Juan Diego and his vision of Mary - who was later honored as the Patroness of the Americas. Starting with a miniature disposable loaf pan, I bent and molded it into the shape (more or less) of a shrine. 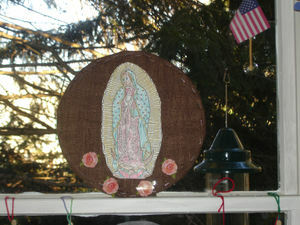 On the back wall I taped a holy card showing the image of Our Lady of Guadalupe. Just below the card I placed one of our favorite "starry" candles. (Note: Bill warned me this might melt the plastic card, so I'm keeping a close eye on it.) To the right and left are two more candles for good measure - one can never light too many candles! Actually the aluminum backdrop illuminates the vision quite nicely! "Suddenly he realized that no one was looking at the beautiful roses on the carpet. They were all looking at his tilma. "Juan Diego looked down. His rough cactus-fiber tilma had been changed into a painting of the Lady just as he had last seen her at the foot of Tepeyac." 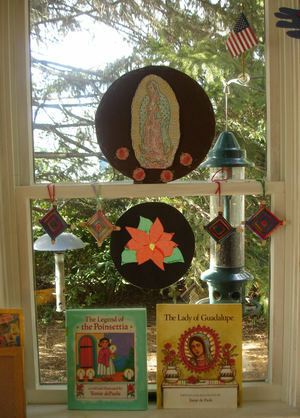 We added our poster to our Mexican corner, just above the stained glass poinsettia and our God's Eyes from yesterday. I wish you a Blessed Feast and a Happy Evening! Now, please bear in mind, this thoughtfully composed basket in no way accurately represents the state of affairs in my "general" craft bins, the ones I allude to quite often in my posts. Those bins I shall leave to your imagination (for now), but I thought you might like a peek into this week's craft basket! I like to assemble the materials for the week in this way - it's a bit silly, but I find it helpful (and inspiring) to have all these goodies in one place throughout the week. 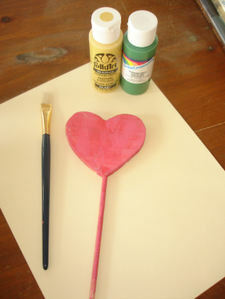 So now the trick will be turning all these items into fun and meaningful crafts for, and with, the children. Stay tuned ~ I will post as we go!